In this area of the Apparel Search fashion brand directory, you will find men's fashion brands from leading apparel companies and fashion designers. On this particular page, you will find information regarding men's clothing with the Abercrombie & Fitch brand. You are welcome to utilize this section of our clothing guide to review Abercrombie & Fitch news, Abercrombie & Fitch blog posts, Abercrombie & Fitch photos, and more. Please understand that you may run into a few photos or a tad of information that does not actually pertain to the men's Abercrombie & Fitch fashion brand. Unfortunately, no search technology is absolutely perfect. 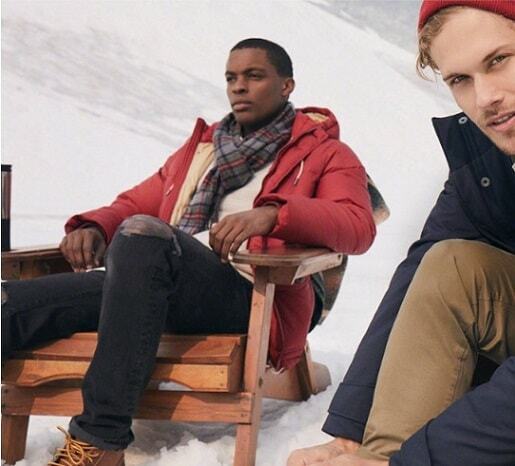 We will continue to do our best to bring you as much information about the men's Abercrombie & Fitch fashion collection as possible. Abercrombie & Fitch is an American retailer that focuses on upscale casual wear for young consumers, its headquarters are in New Albany, Ohio, a suburb of Columbus. The store name is also the company brand. The company operates two other offshoot brands: Abercrombie Kids & Hollister Co. The Abercrombie & Fitch brand image is heavily promoted as an international near-luxury lifestyle concept. The company began cultivating an upscale image after the 2005 opening of its Fifth Avenue flagship store alongside Prada and other upscale retailers. Having for years used high-grade materials in the construction of its merchandise, and pricing them at "near-luxury" levels, A&F introduced the trademark Casual Luxury as a fictional dictionary term with multiple definitions such as "[using] the finest cashmere, pima cottons, and highest quality leather to create the ultimate in casual, body conscious clothing," and "implementing and/or incorporating time honored machinery ...to produce the most exclusive denim..." This upscale image has allowed A&F to open stores in international high-end locations and further promote the image by pricing its merchandise at almost double the American prices. The only way to ensure you are purchasing genuine first quality gear is to visit one of their namesake stores or to visit their online store. For a list of these locations please visit Abercrombie.com and use the "Find a Store" tab. To purchase genuine Abercrombie & Fitch gear online visit their website, Abercrombie.com. From anywhere in the world this site will direct you to your country specific site. If you have changed your mind and do not wish to research the brand Abercrombie & Fitch, you can use the search engine on this page to find another clothing label that may be of more interest. You may also have interested in learning more about the women's Abercrombie & Fitch brand. Apparel Search is a leading guide to fashion, style, clothing, glam and all things relevant to apparel. We hope that you find this Abercrombie & Fitch page to be helpful. Please keep in mind that sometimes the brand of clothing you've always loved won't fit as well as it has in the past. As a matter of fact, the quality could change at your favorite designer's shop, as they adjust their demographics or respond to shifts in consumer spending etc. So remember to keep your favorite and most familiar brands on hand. However, keep your eyes open for the up-and-coming designer labels, as well. Today's unknown designer brand could become tomorrow's favorite!